Perhaps it stems from going to summer camp and visiting relatives back east as kid and looking forward to letters from my parents and friends. Add in, going three thousand miles away to college and waiting with baited breath for care packages from my parents as well as letters from my friends and boyfriend, I dig letter writing. I may not be the best at keeping up via phone calls but I'll drop you a few lines like it's nothing. I also LOVE getting mail other than bills so I write in hopes that others will write back and my trips to the mailbox are a little more exciting than the arrival of the new IKEA catalog. Even when I was younger, I dug stationary. My family has always given me custom stationary so my love is basically ingrained deep within. 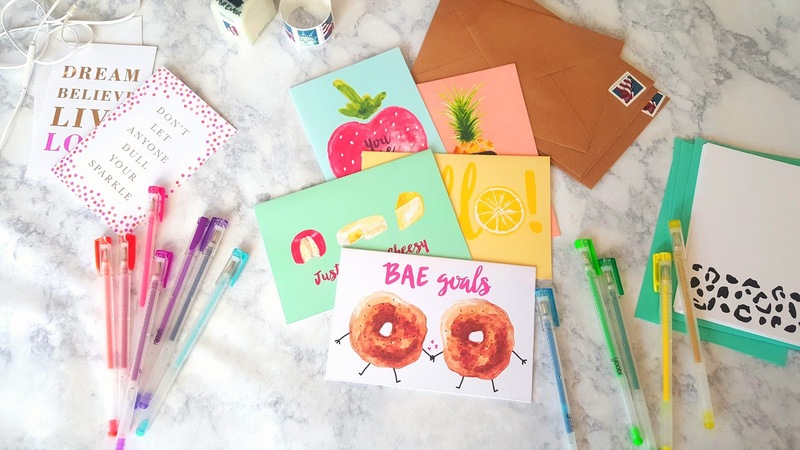 Even while away at school I still made it a point to write letters on cute note cards (I'm talking Sanrio and early Disney Store classic Winnie The Pooh days) and even had a small side hustle hand making cards my freshman year. So, I put it out there I was collecting addresses and began my card writing project. After an initial burst of cards, it's been slow and steady the last few months because life. Also - I want to take my time with my words and not just dash off a quick thought that doesn't mean much. I must admit, I do get quite the rush when I drop a stack of pretty envelopes in the mail and imagine the reactions; sorting through the bills and weekly mailers and seeing a handwritten envelope with their name on it. A smile spreads across their lips at the unexpected arrival and with an extra pep in their step they head in the house. At least that's how I feel when it happens to me. We'll see how many I get back. But that won't stop me from sending the ones I have and picking up even more.When I see a cute set I can't help but scoop it up and between trips to Target's Dollar Spot, Home Goods and all the cute nonsense that shows up in my social media feeds, I'm covered. Do you like stationary? Where do you buy yours?